The print is technically a portrait of my good friend Casey, a wonderful artist and printmaker, whom I had the honor to give this actual tattoo of Cup of Gold’s. In this same year, so much had happened in Casey’s life, that I believe I saw her grow, or morph into something new and spectacular in this time. The symbolism of the tattoo was magically connected to her reality. Agreed to be smothered in ink and printed upon sekishu as well. Then I used the actual tattoo-stencil to create the five color woodblocks for the ‘cup of gold’. I love that this print conveys all human aspects of the story above, without necessarily depicting a tattoo. I am very happy with it! 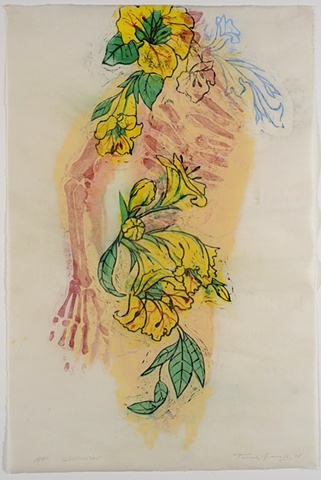 “14+1: Hawai’I Printmaking Now” curated by Margo Ray.